I have spending some time at the local animal shelter, my volunteer work/occasional summer job. When I am not playing with dogs, helping people find lost cats, or figuring out how to put staples in the copier, I find myself thinking about the shelter as a place where the relationship between humans and animals, culture and nature is negotiated. 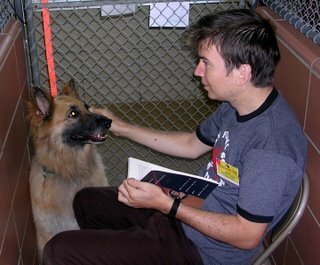 It occurs to me that much of the work that the shelter does, taking in strays, unwanted litters, etc, has to do with overcoming the contradiction between the attitudes people have towards their pets, as commodities, and the existence of animals as living, breathing, loving, and occasionally annoying creatures. For example it is not uncommon for someone to call looking for someplace that will take their elderly possibly blind or deaf cat that no longer uses the litter box (These calls are usually about cats and not dogs). Some of these people have actually deluded themselves into thinking that there are tons of people out there just dying to have one of these cats. ("No, I am not really interested in one of the dozens of adorable kittens that you have. Do you have anything that reaks of urine?") After I explain to the person the procedure, what will happen, the likelyhood of their cat getting adopted, the fact that there are so many cats that the shelter has a waiting list for people who want to surrender their cats, and so on, they usually then ask if the shelter has any kittens for adoption. Sometimes they will ask this after explaining at length that they do not have the money to care for their current pet. Of course this is may be true, but given that some of these people are willing to shell out $100 (the cost of adopting a kitten) for a new pet, I think that it is more accurate to say that it is just not worth it for them to spend the money. Going to the Vet is like going to one of those run down old places that offer "TV/VCR Repair," it just does not make economic sense. If something wears out, gets too old, why not just buy a new one? In the Shelter there is a poster stating that the animal shelter should be considered a community service, not unlike the hospital, the fire department or the police, a part of the "safety net," what Hegel called "The Police" in the expanded sense of the term. To borrow a phrase from Polyani, the police exist wherever the commodification of labor, land, and money produces disastorous results: that is, wherever the "market" of labor or land would result in death and destruction. I would add animals, or at least pets, to this list of what he calls "fictious commodities." I do not find his (Polyani's) term to be so helpful, they are not really fictious, but rather things that either antagonistically resist commodification, or do so passively, as in the case of the environment, through unintended consequences. So in this day and age of "free markets" we are left with the remnants of the "safety net," underfunded cramped buildings with overworked people dealing with whatever sector of society is no longer profitable: the sick, the ederly, the abandoned. Pets protect us from the alienating effects of capitalism, the isolation and loneliness, and in turn the shelter attempts to protect them from a culture based on the exchange of commodities. I realize that this is not the most thought out post, but hey it will at least please all of those people who are looking for articles on Karl Polyani's economic theories and cats litter box use.